Gannon’s 8th annual Easter Retreat, on the powerful pacific ocean at Barra Vieja Beach (30 minutes from Acapulco). 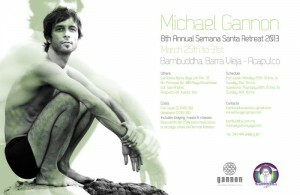 Michael’s well known semana santa retreat is back at Bambuddha. You may book for the full week, Monday – Sunday. You may also book only for the usual long weekend, Thursday – Sunday. 25% off for Mexican Nationals! Special early booking 25% discount for Mexican Residents paying in full by February 1 . This retreat always fills up early with people securing their semana santa yoga plans. Secure your space NOW! With only a US$100 deposit! Accommodations, all food, all yoga sessions!